Ismail Abass, 47, is a farmer at Baga village in Bumbuli District as well as being the father of seven. He is one of the beneficiaries of the N2Africa project. Before the project, his main produce were vegetables (tomato, cabbage), maize, and Irish potato. He grew common bean mostly for home consumption, but he did not use and was not aware of any improved seed varieties and he did not apply fertilizers to the beans. Mr Ismail Abass feeding his cows. “Here in Bumbuli most farmers cultivate common bean for home consumption as opposed to vegetables, which are cash crops. Many of us, including myself, practice indigenous bean production. We do not follow proper spacing, we use low quality seeds and zero fertilizer application, resulting in low productivity. On average I used to plant 35 kg of low quality seed on one acre and harvest only two and a half to three bags,” said Ismail. In 2015, he was identified by the leaders and agriculture extension officer from his village to participate in N2Africa’s common bean demonstration trials where he learned a lot on improved common bean production including the use of improved seed varieties (Lyamungo 90), the use of fertilizer, and timely planting and weeding. 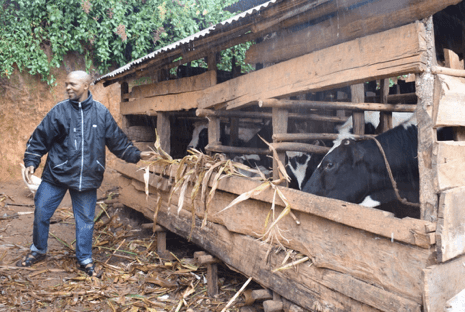 “Since the project started in 2015, I have been planting 25 kg of improved seeds (Lyamungo 90) with fertilizer (DAP) and harvesting between 8 to 10 bags per acre,” said Ismail. For the three years he has been involved with the N2Africa project, he has produced more than 54 bags from 6 acres. He started with one acre, then increased to three acres then to six acres. He has sold 48 bags of common bean at a price of $0.9/kg, earning a total revenue of $4,364. “I used the money to pay school fees for my children from primary to secondary school, improved my house, purchased a television, and diversified to animal keeping. 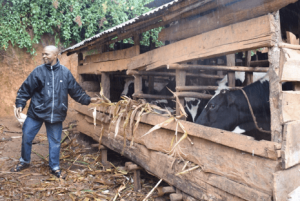 I now have eight cows, seven goats, and five sheep because of the N2Africa project, and I use manure from the animals for maize and vegetable production,” added Ismail.